Empirical facts aren’t put into quote marks; when words are surrounded by speech marks, their validity is in question. 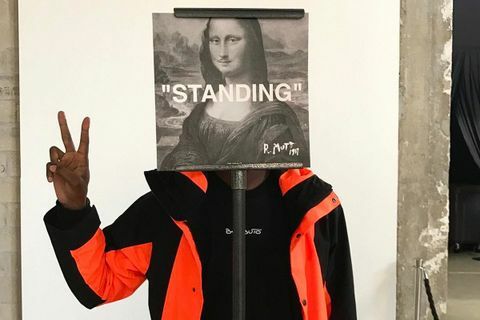 By presenting words as citations, Abloh is taking them out of context, and questioning their seriousness. When he puts “Sculpture” on the side of a handbag, he’s provoking the viewer. What’s the difference between a handbag and a piece of art, really? 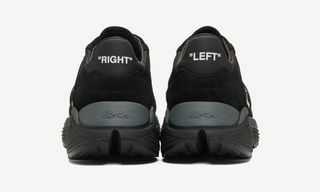 Virgil’s choice of typeface is also significant. Developed in 1957, Helvetica has become so ubiquitous that it’s almost invisible — the font is used in the logos of American Apparel, General Motors, Panasonic and BMW, as well as on federal income tax forms and the insides of NASA’s space shuttles. 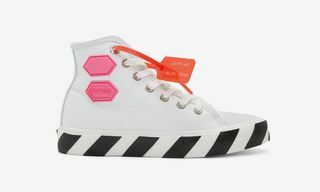 It’s a masterpiece of the mid-century era that Abloh worshipped when he was studying architecture. 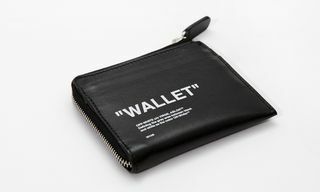 Just like Demna Gvasalia, who gives shout-outs to DHL and Balenciaga’s corporate owners Kering, Virgil understands that irony is the most effective way of communicating these days. His subtle-yet-deliberate jabs engage the viewer, encouraging them to share his work until it goes viral. His not-so-serious tone places Off-White above the rest of the conversation, because, to casual observers, it looks like he doesn’t even take it seriously. These $2,000 boots? They’re just for walking. 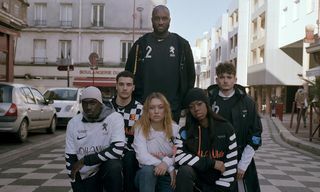 You can find Virgil Abloh’s 5,000+ word interview in issue #32 of 032c, alongside pieces with Jason Dill, Bella Hadid and Nicolas Ghesquiere, among others. Visit the publication’s webstore to get a copy for yourself. 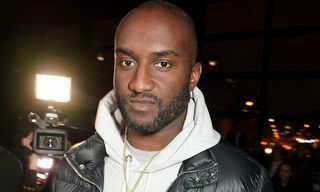 Now read why Virgil Abloh should be leading a fashion house.